Niels Holten-Andersen has been inspired by biological metal coordination complexes and the remarkable ways in which nature makes use of them to form complex dynamic structures. Scientists cannot copy such systems precisely, but they can mimic them using simple and inexpensive molecular components. 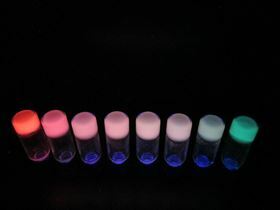 To create the color-changing gels, the Holten-Anderson team turned to synthetic polymers rather than proteins and fluorescent lanthanide metal ions that can bind to them in a self-assembly process. Different metals give different properties and different colors of light emitted. Blue emission with lanthanum, red with europium, and green with terbium. However, creating a white-light emitter was the aim as it is easier to see any color change from white as opposed to sense a green becoming slightly more or less green. "By using the lanthanides, we could still control the properties of our gels, but now we'd have light emission that would reflect any changes in those properties," explains Holten-Andersen. "With those two features intimately coupled, any time the physical properties were disturbed - say, by a change in the temperature of the nearby air or the pH of the surrounding water - the color emitted would change." Such a material might be used as a coating on pipes, cables, and other critical infrastructure to show when a component, on an oil rig or wind turbine, might be in danger of imminent failure. Preliminary tests with terpyridine as a ligand to the lanthanides demonstrated proof of principle in solution prior to constructing terpyridyl end-capped four-arm poly(ethylene glycol) polymer (PEG) lanthanide materials as color-changing hydrogels. With the simple ligand system, gentle heading caused the lanthanide and ligand to part and so give a color change under ultraviolet, and the system then reassembles on cooling. Similar responses were seen with a change in pH. The hydrogels responded just the same in terms of white light emission shifting to another color when an external stimulus was applied. Interestingly, the team could exclude lanthanum itself from the system as the terpyridine ligand is a blue emitter, so only europium and terbium are needed for white light with the blue coming from the ligand. The hydrogels respond reversibly to temperature and pH changes and also to exposure to ultrasound, the team reports. "Regarding future plans, one big goal is to transfer this self-sensing molecular mechanism into polymer materials that can withstand real world environmental conditions," Holten-Anderson told Materials Today. "Currently we are therefore exploring an expanded polymer platform."